Fire danger ratings across the west are climbing as temperatures rise, particularly in the Kootenay region of BC. In related news: a wildfire that killed a California firefighter on the weekend has doubled in size resulting in road closures and evaculations. 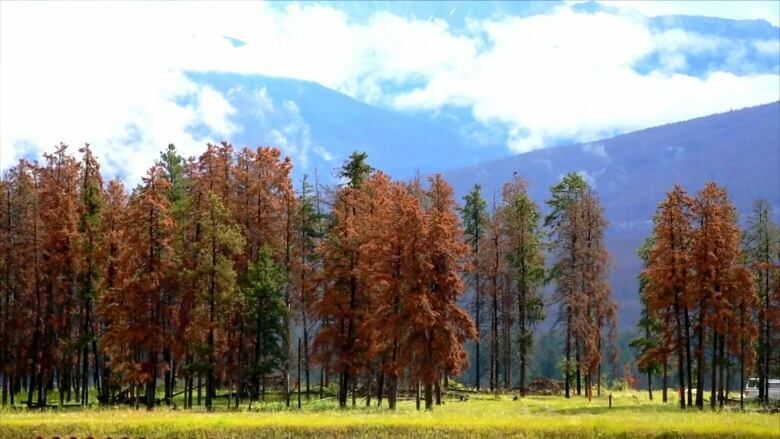 Elsewhere, the mountain pine beetle is turning Jasper National Park red; and Finland feels the heat but it’s unrelated to the Trump-Putin summit. 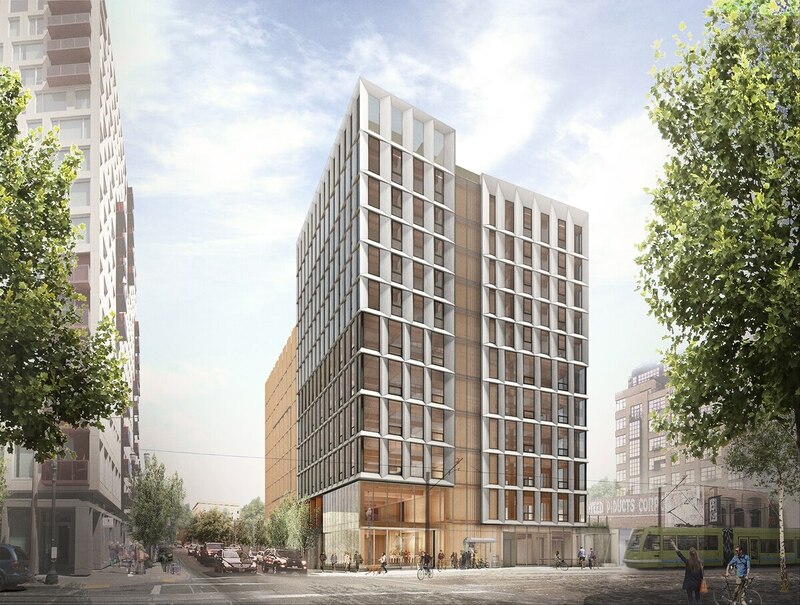 In Wood Product news: plans for a record-setting timber tower in Portland are off due to cost concerns; Oregon State U is investigating the effects of moisture in mass timber buildings; Finland has plans to build a modular floating pool with CLT; and Tom Maness’s legacy is acknowledged by both Oregon and BC’s wood product sectors. Finally, the US is taking its trade war with China, Canada and others to the WTO. WASHINGTON — The Trump administration on Monday brought cases against China, the European Union, Canada, Mexico and Turkey at the World Trade Organization for retaliating against American tariffs on imported steel and aluminum. …If the WTO agrees that the retaliatory duties violate its rules, it would assess the damage and calculate the tariffs that the United States would be entitled to impose in response — retaliation for the retaliation. But WTO proceedings can drag on for years. …The WTO gives countries broad leeway to determine national security interests. But there was long an unwritten agreement that WTO member countries would use the national-security justification only very sparingly to avoid abuses. CALGARY – From Chinese bank notes to Israeli high-tech, Chad Wasilenkoff has tried to break into markets around the world to diversify the Vancouver-based business he founded. Paper products maker Fortress Global Enterprises is primarily focused on selling dissolved wood pulp from its Quebec mill and company chairman Wasilenkoff is constantly on the lookout for new opportunities to stay competitive in an increasingly globalized economy. More Canadian companies are looking to follow the route. …An Export Development Canada survey of 1,000 exporters… suggested 64 per cent plan to export to new countries, up from the below 50 per cent the proportion has generally hovered at for the past five years. …Companies like Fortress that do venture out meet a wide variety of challenges, including running up against tariffs, stiff competition and failed ventures. The deal to build a record-setting wooden Portland tower that was expected to be the tallest in North America is off. Framework, which was designed to be 12 stories including a roof deck, was to be constructed from cross-laminated timber, an innovative lumber product made by gluing sheets of wood together. Two sources, one at City Hall, tell WW the cost of building the project proved too high. Framework’s developer, a Portland developer called project, had received commitments from the city and the county housing authority for affordable housing subsidies—despite a whopping price tag. …A statement tonight from the developer blamed “market challenges” for the decision not to move forward with the project. But it did not address the fact that the project had a funding gap since last year. OOPEAA (Office for Peripheral Architecture) has won an invited competition for the design of the Allas Sea Pool Family in Helsinki, Finland. Constructed on floating platforms, and designed as a modular, flexible, adjustable system, the Allas Sea Pool Family is intended to be a new global typology for coastal sites, where building on land is not feasible. …The Allas Sea Pool Family is intended as a scalable and applicable typology for any coastal site. Indoor spaces can vary between 8500 to 37,500 square feet (800 and 3500 square meters), constructed on floating platforms varying between 20,000 and 100,000 square feet (2000 and 10,000 square meters). The scheme is constructed of cross-laminated timber, in-keeping with the ecological, sustainable, and adaptable ethos. During the construction process, modular elements for the floating structure can be transported via waterways. Until recently, New Zealand developers had been slow to adopt the engineered timber structures in contrast to leaders in Australia, USA. Now, more engineers here are recognising engineered wood’s advantages with new building information modelling technology for designing commercial buildings. In August a national conference on engineered wood for commercial and multi-residential building is set to attract hundreds of early adopters as New Zealand moves fast to catch up to our Australian neighbours in sustainable commercial buildings. One distinct advantage is speed. Engineered wood buildings are erected much faster than traditional poured concrete slabs and on-site welded steel columns. The key to wood’s speed and accuracy comes from using new design and manufacturing software known as “building information modelling” (BIM). Engineered wood structures are ripe for using these highly accurate systems and automated machining technologies. Corvallis, Oregon – Thomas Maness, the Cheryl Ramberg-Ford and Allyn C. Ford Deal of the College of Forestry at Oregon State University, passed away Thursday, July 12, in Corvallis. He was 63. Maness had served as the college’s dean and director of the Oregon Forest Research Laboratory since 2012. He arrived at Oregon State in 2009 to serve as head of the Department of Forest Engineering, Resources and Management. …”Thomas will be greatly missed,” said OSU President Ed Ray. “Under his leadership, last year the College of the Forestry was declared the second best college of forestry in the world. …In 1994, Maness founded the Canadian National Centre of Excellence in Advanced Wood Processing at the University of British Columbia and led the design and implementation of an award-winning undergraduate manufacturing technology program. The patchwork of green forests in and around Jasper National Park is increasingly interrupted with splashes of red. It’s a sign of destruction caused by the mountain pine beetle and it’s more apparent than ever before in Alberta’s westernmost forests — altering the landscape that greets visitors to the iconic national park and prompting debate about how to manage the effects of tinder-dry, dead wood near the town site. 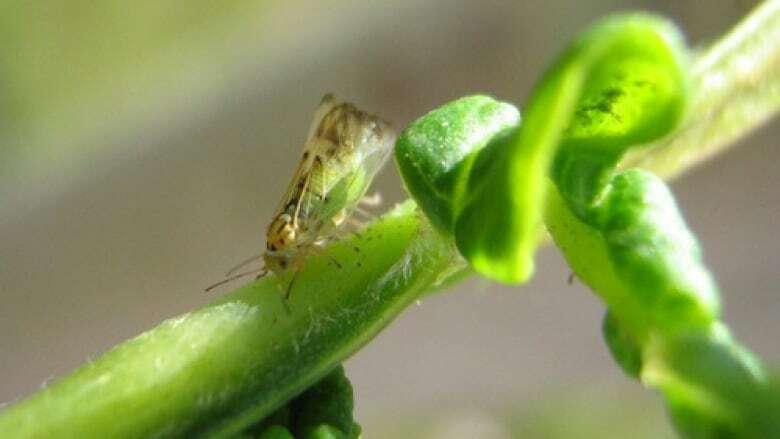 …The Alberta government has spent hundreds of millions of dollars to stop the spread of the pest. The decade-long efforts have slowed the beetle’s movement toward the carefully managed forests that supply wood for lumber and other purposes located to the east of Jasper. …But in the meantime, some Jasper residents are increasingly worried about not just the esthetics of red, rusty forests, but also the fire hazards. How do you solve a housing crisis in a remote Northern community? In Fort Good Hope, N.W.T., the answer is simple: you get to work. …Fort Good Hope is surrounded by massive spruce trees — but lumber is a precious commodity. Before the portable sawmill arrived this spring, it was nearly impossible to turn logs into boards suitable for construction projects, contributing to the community’s ongoing housing crisis. Now, people in Fort Good Hope are developing the skills they need to work their way out of that crisis, using their own people and resources to do it. …Inadequate housing in Fort Good Hope has been an issue for years, long topping the list of problems for community leaders to solve. Many homes are overcrowded and in desperate need of repairs. Board to audit Western Forest Products Inc.
VICTORIA – The Forest Practices Board will examine the activities of Western Forest Products Inc. on tree farm licence 39, in the Campbell River Natural Resource District, during the week of July 23, 2018. Auditors will examine whether harvesting, roads, silviculture, fire protection and associated planning, carried out between July 1, 2017, and July 27, 2018, met the requirements of the Forest and Range Practices Act and the Wildfire Act. Tree farm licence 39 is made up of four geographical areas called blocks. This audit will examine activities in blocks 2 and 5. Block 2 is located northwest of Campbell River, near the community of Sayward, and Block 5 is located about 65 kilometres north of Campbell River, on the mainland coast. Can ‘Moneyball’ Fix How The West Manages Wildfire? The U.S. government spent a record $2.9 billion fighting wildfires last year. …It doesn’t have to be that way. Up against pressure from politicians and the public, risk-averse bureaucracies drive their fire managers to spend millions of dollars suppressing wildfires that pose relatively low risk compared to the benefit of letting them burn. …The U.S. Forest Service and other state and federal agencies fight those fires often knowing that doing so can be counterproductive. Scientific evidence …points to the ways that suppressing fire leads to unhealthy forests. It incentivizes the construction of more homes in fire-prone wildlands. And it sets the stage for the bigger, costlier blazes… Suppressing too many fires also has the effect of a payday loan: The short-term gain from suppression conditions the landscape for future fires burning in extreme conditions. …Matt Thompson said they often call their work “Moneyball for fire” — a book reference about advanced statistics. BERLIN — Never mind the responsibility of hosting a historic summit, Finland is sweating under an unusual heatwave. The Finnish Meteorological Institute said Monday that the mercury in the normally cool Nordic nation is expected to reach 30 degrees Celsius (86 Fahrenheit) on Tuesday. Meteorologist Ville Siiskonen told The Associated Press that such temperatures are “either unusually or exceptionally high for the time of the year, however, they are not unprecedented.” In July 2010, Finland recorded an all-time maximum temperature of 37.2 Celsius (almost 99 Fahrenheit). The near sauna-like temperatures during U.S. President Donald Trump and Russian President Vladimir Putin’s visit to Helsinki have also prompted forest fire warnings in all but the northernmost tip of the country. A couple of locations in the East Kootenayare now being rated as having ‘extreme’ danger ratings for wildfire, as temperatures continue to range well into the 30s C. RDEK Fire Services-South Country alerted the public via Facebook earlier this afternoon that its coverage area is now rated extreme. “OK folks… we’re at the uppermost end of our scale!” The department stated. The BC Wildfire Service operates about 260 weather stations, including 48 in the Southeast Fire Centre, which send reports on an hourly basis. These hourly weather observations, supplemented by data from other agency stations, support fire weather forecasting and the Canadian Forest Fire Danger Rating System (CFFDRS). “The computer-based CFFDRS is the primary fire management decision aid in Canada. With it, fire managers can assess the potential for ignition, spread and burning intensity. This information is used for making fire prevention, preparedness and suppression decisions, as well as other general fire management decisions. Thunderstorms ignited more than 75 small wildfires in Southwest Oregon over the weekend. Firefighters extinguished many of the starts, but at least three have become large fires. …Hot dry weather and more thunderstorms are forecast Monday in Southwest and Northeast Oregon. Carol Connolly, with the Northwest Interagency Coordination Center, says firefighters are preparing for new lightning-caused fires. …Oregon currently has five Forest Service air tankers, several smaller aircraft and 40 smoke jumpers ready to respond to new fires. More than 1,000 firefighters have been deployed so far this year. Fire danger is rated high across most western Oregon… State fire managers are asking people to use caution and good sense while working, recreating, and camping. 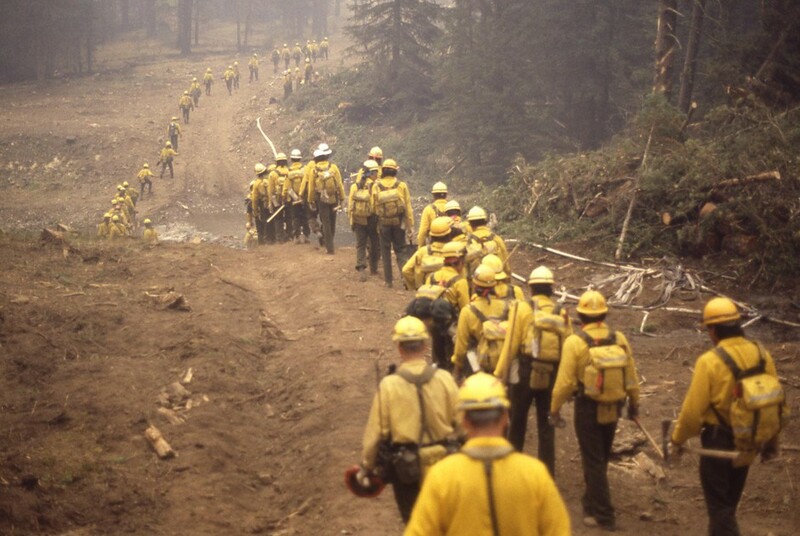 …More than half the wildfires in Oregon this year were caused by human activity. Of 435 fires so far, humans started 261. MARIPOSA, Calif. — A wildfire that killed a California firefighter grew quickly and forced the closure of a key route into Yosemite National Park as crews contended with sweltering conditions Sunday, authorities said. The so-called Ferguson Fire that broke out Friday scorched nearly 7 square miles (18 square kilometers) of dry brush along steep, remote hillsides on the park’s western edge. It was burning largely out of control, and officials shut off electricity to many areas, including Yosemite Valley, as a safety precaution. …Evacuations also were ordered in rural communities just outside the park, and people in nearby lodges and motels were told to be ready to leave if flames approach. A stretch of State Route 140 into Yosemite was closed, and motorists were urged to find alternate routes. The terrain surrounding Mariposa County’s deadly Ferguson fire is a virtual tinderbox primed for disaster, experts say. On either side of the Merced River, south of Highway 140, hillsides are filled with trees that have been killed by five years of drought and a bark beetle infestation, according to state maps. The ground is carpeted with bone-dry pine needles. As crews battle to keep the 9,366-acre blaze from spreading into these ready-to-burn hillsides, some worry it could unleash the destructive power of last year’s Detwiler fire, which burned for five months through dead forest and destroyed 63 homes. …The combination dead or dying fuels mixed with fire poses an amplified hazard for firefighters, Williams said. “The biggest overall risk is that these dead trees have an increased risk of falling – themselves and their limbs falling on firefighters,” she said.